Moto G5 Plus was launched recently at MWC2017 in Barcelona. In just a couple weeks the smartphone enter to Indian market and creating a lot of buzz. But in this price range smartphones already released in India and best smartphone in Indian market is Xiaomi Redmi Note 4. These two smartphones have metal body and will have a tough time to convince the buyers in India. Both the smartphones offers full HD 1080p display . The Xiaomi Redmi Note 4 sports 5.2 inch display and Moto G5 Plus sports 5.5 inch bigger display than Redmi Note 4. 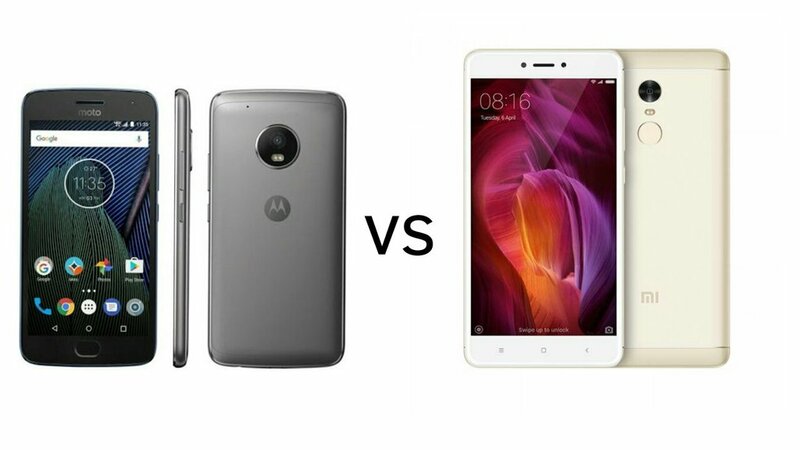 If you are looking for performance both Moto G5 Plus and Redmi Note 4 will not disappoint you and powered by Snapdragon 625 Soc. The Moto G5 Plus comes with 12Mp rear camera with dual auto focus , 4K video recording capability, f/1.7 aperture and dual LED flash. On other hand Xiaomi Redmi Note 4 comes with 13Mp rear camera with PDAF, f/2.0 aperture , full HD video recording capability and dual LED flash. Both the smartphones offers 5Mp front facing camera for selfies.. The Moto G5 Plus runns on latest Android 7.0 Nougat operating system. The Redmi Note 4 runns on MIUI 8 based on Android 6.0 Marshmallow operating system. Both Moto G5 Plus and Redmi Note 4 offers dual SIM capability . Xiaomi offers 4GB RAM and 64GB internal storage. Moto G5 Plus offers 2GB RAM / 16GB inbuilt storage and 3GB RAM / 32GB inbuilt storage. This is the deal breaker , the Moto G5 Plus packed by 3000mAh battery and Redmi Note 4 packed by 4100mAh battery. The Xiaomi Redmi Note 4 available in three variants in India -2GB RAM / 32GB storage for RS.9,999/- , 3GB RAM / 32GB storage for RS.10,999/- and 4GB RAM / 64GB storage for RS.12,999/-. The Moto G5 Plus available in two variants – 3GB RAM / 16GB storage for 14,999/- and 4GB RAM / 32GB storage for 16,999/-..